Zap! The DeStat II is incredibly easy to use and removes dust and static charge from audio/video media with a 10 second treatment. High performance enthusiasts know that static charges on analog and optical media - LPs, CDs and DVDs - can lead to sudden and distracting noise that compromises the experience. Simply place your media on or hold it under the Destat II and press one button! 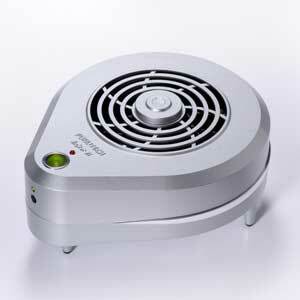 The powerful fan removes dust while the Destat II's Balanced Ion Flow Generator eliminates static.